It was early morning and we were sitting near an Acacia thicket, the suns light barely peering over the low hill to our right. A group of Impala, all females but one, grazed peacefully about 100 yards away under the watchful eye of the male bent on keeping his harem together. The Serengeti of northern Tanzania stretched for miles in all directions as the night hunters gave way to day. The high pitched yapping of a spotted Hyena shattered the peaceful scene. They seemed close yet concealed by the grass. Every Impala head sprang up, stretching to catch movement, their noses testing the damp air for a scent. So intent on the scene unfolding that we at first failed to see the flash of bright color that passed only a few feet from us settling on an Acacia branch. I slowly turned my camera lens and snapped the picture of the Lilac-breasted Roller, one of the most stunningly beautiful birds in Africa. 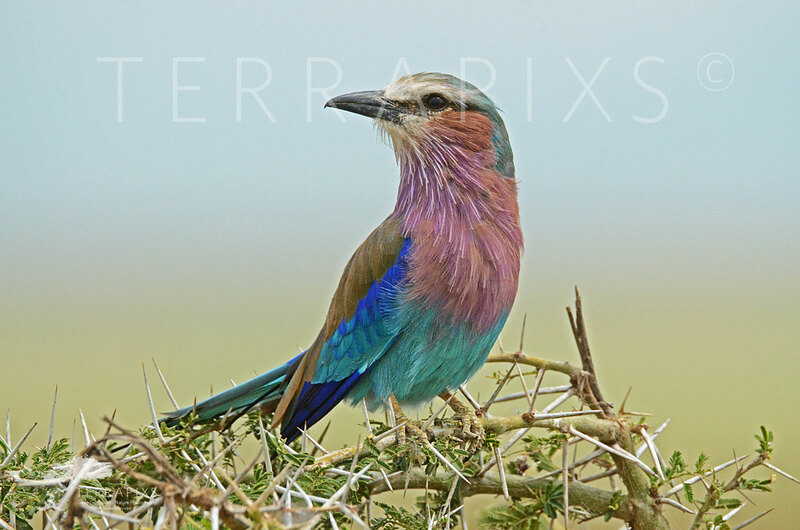 The Lilac-breasted Roller (Coracias caudatus) is an African member of the roller family of birds, the Coraciidae. Though quite widely distributed, it is seldom seen in groups preferring to be alone or in pairs. These birds are monogamous, that is, they mate for life. They are strong, acrobatic fliers and actually mate on the wing. The sexes are alike in coloration though males may be slightly larger in size, up to 14.5 inches long. During the breeding season, the male will rise high in the air and descend in dives and swoops while calling in harsh, unmistakable tones “rak rak rak”. The flat nest is built of grass well off the ground, often in hollowed out tree cavities. Lilac-breasted Rollers generally lay 2-4 white eggs per clutch, typically one clutch per year with the eggs being incubated by both parents. The chicks are born altricial, that is, dependent on parental care but are fully feathered after 19-20 days. Most ground nesting birds on the other hand have chicks that are born precocial being able to fend for themselves within a few hours of hatching (ie., chickens, quail, pheasants, etc). Lilac-breasted Rollers do not associate with human habitation preferring areas of open bush with trees spaced about. They seem to love Acacia trees such as the tree this bird is perched on and will sit on high branches surveying the landscape for prey. To feed they swoop down off their perch on the unsuspecting prey. Rollers eat a lot of insects, generally on the ground, but also prey on lizards, scorpions, snails, small birds and rodents. If the prey is large, they will carry it to their perch and dismember it. Of particular interest is their flight from which they get their name “rollers”. It is a well choreographed up and down, rolling pattern of flight. 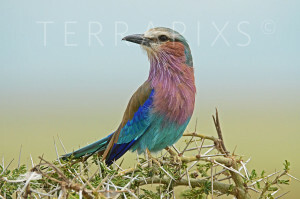 There are many species of unique birds in Africa but the Lilac-breasted Roller, which is the national bird of Kenya, has a special place. Hope you get to see one of these guys in the wild for it is a treat you will never forget!